I’m on a roll with trying more aburi sushi so after I found Sushi Hub on Instagram, I knew I had to pay them a visit. They’re located on Main next to Long’s Noodle House and Au Petit Cafe. 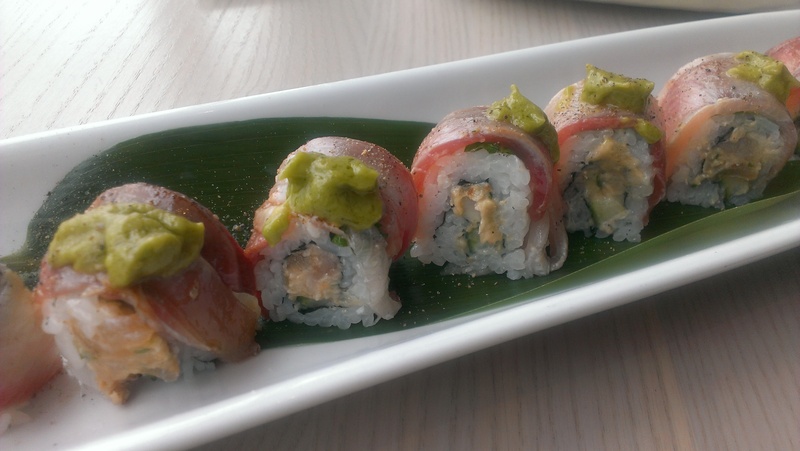 This entry was posted in Asian, Food Reviews, Japanese and tagged aburi sushi, specialty rolls. 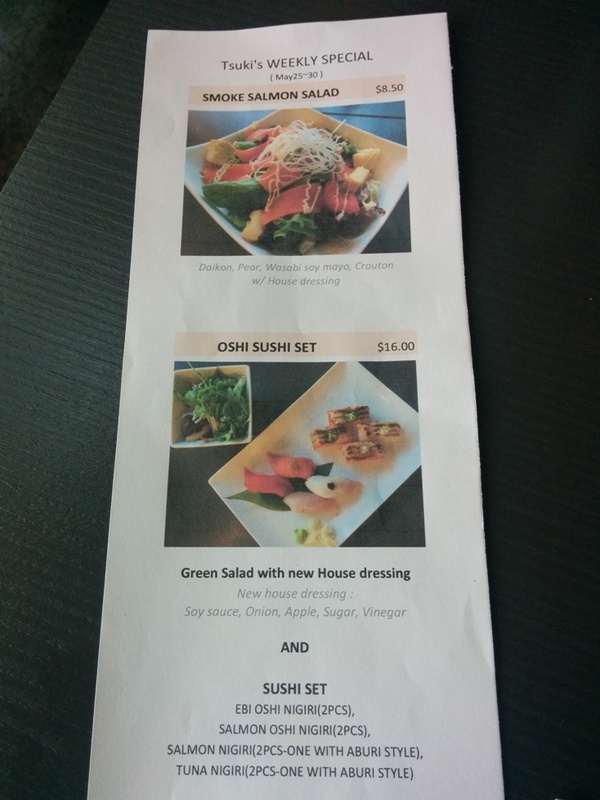 Tsuki Sushi Bar had a 90% rating on Zomato so I suggested it for a Friday lunch. It’s located next to Taishoken Ramen and across from International Village. The restaurant is small but spacious enough and has high exposed ceilings. This entry was posted in Asian, Food Reviews, Japanese and tagged aburi sushi, chopped scallop, sashimi salad, smoked salmon, spicy tuna. Miku Restaurant: As Good as They Say! Miku Restaurant is one of the most talked about restaurants in Vancouver and it was about time that I tried it! Miku is quite the fine dining establishment and I opted to go for lunch because it’s slightly cheaper (but equally tasty!). 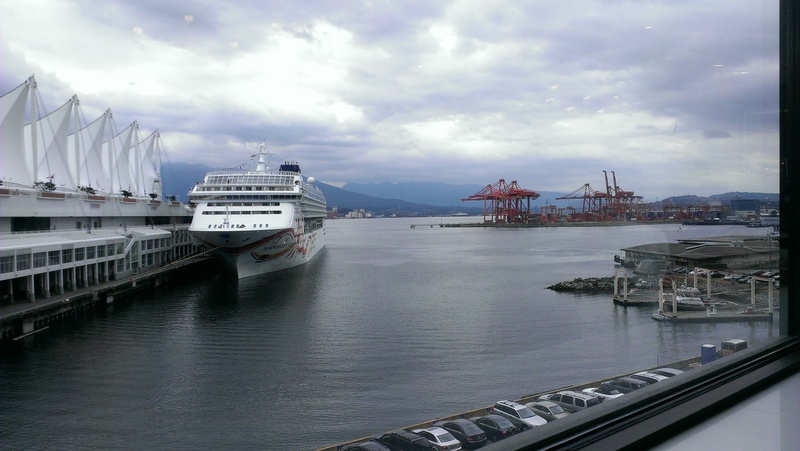 They recently moved to a new location next to Canada Place with a lovely view of the water. The restaurant had an open view of the kitchen and it felt very clean, sleek and modern. However, I was surprised that it was quite loud too. Or maybe it was just where we were sitting. There was a mix of families and people on business lunches as well as people dressed more casually. 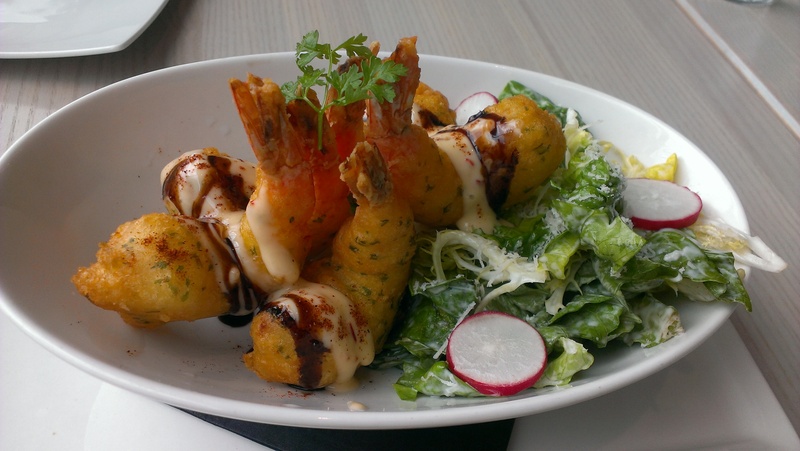 We started off with the Ebi Fritters (white tiger prawns, herb beer battered, sweet chili aioli, chili powder, soy balsamic reduction). There were five pieces of large bouncy prawns and the herbs in the batter were evident as well as the chili powder sprinkled on top of each prawn. The batter was light and didn’t feel greasy either. The Caesar salad on the side was rather normal to me. Our helpful waitress asked if we would like to order an extra piece so that we could each have 3 but we declined but it’s good to know that they have that option! Miku is famous for their aburi sushi which is flame seared sushi and it brings out the flavours of the ingredients better. 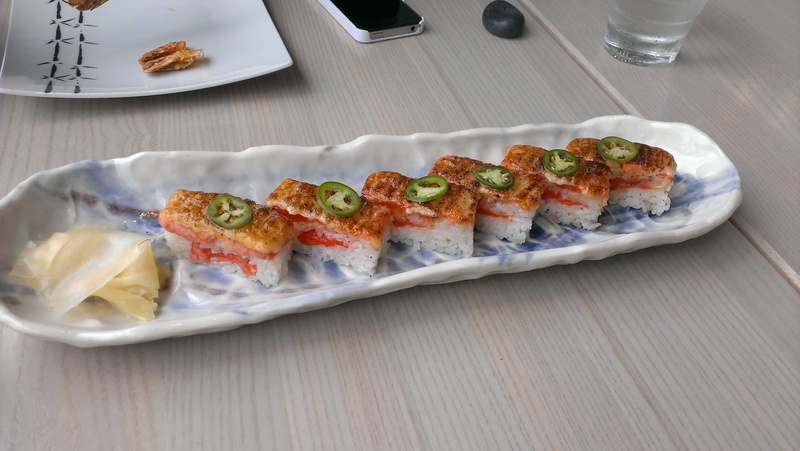 Hence the aburi sushi are must-order items! 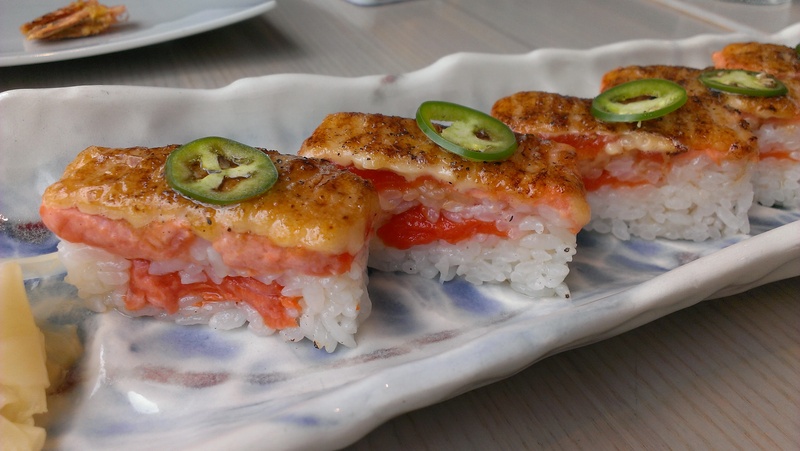 We went for the Aburi Salmon Oshi Sushi (pressed BC wild sockeye salmon, jalapeño, miku sauce). Each piece was carefully prepared and gave you that melt in the mouth feeling. The flavour from the seared salmon gave each piece a slight smokiness but everything blended in with the sauce and ended with a bit of spiciness from the thin slice of jalapeno. Everyone orders this so we had to get it too and now we know why! This is my third time having aburi sushi so I ain’t no expert but it tastes delicious every time! Next came the Aburi Jidori Chicken (seared chicken, marinated cabbage, garlic-soy, steamed rice and miso soup). We were originally going to order the Miso Baked Sablefish but they ran out =( This dish also comes with a bowl of rice and miso soup as well so I think the value was good. The cabbage soaked up all the flavours from the seared chicken and soy sauce so it was incredibly tasty! 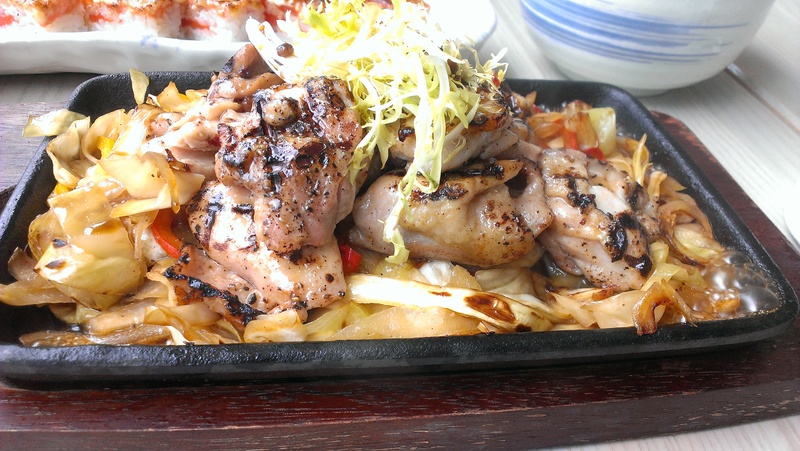 The pieces of seared chicken were juicy and tender as well. Finally we had the Pacific Roll (albacore tuna, jalapeño, cucumber, wrapped in shiso leaf and yellowtail, avocado sauce). The tuna was very fresh and I loved the avocado sauce! It tasted a bit zesty but still very smooth and creamy at the same time. I didn’t really taste the shiso leaf, partially because I’m not sure what it’s suppose to taste like! Every piece was delicious though! My experience here was awesome! The atmosphere was chic and I would love to come back or try their sister restaurant Minami. Except probably not until I have more $$$. It’s expensive for sure but it’s also a fabulous experience. Writing this post has made me excited for their food again! =D Every dish feels like there’s a smorgasbord of flavours going on so if you’re going to treat yourself someday, keep Miku in mind. 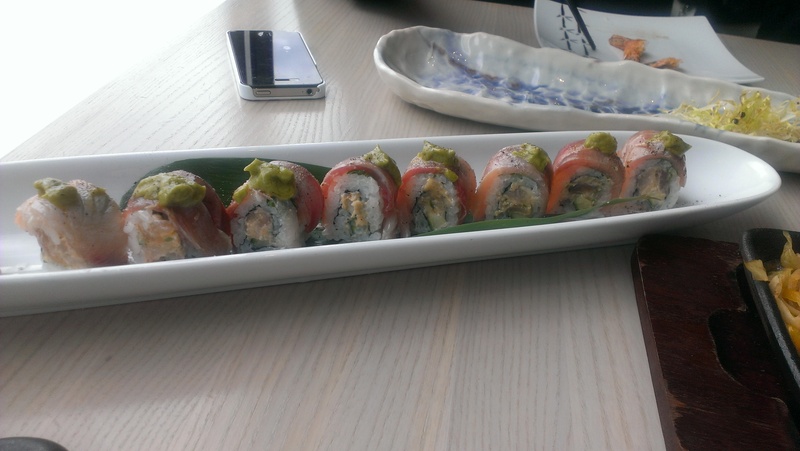 This entry was posted in Food Reviews, Japanese and tagged aburi sushi, Miku Restaurant, tiger prawns.